I love the feather colours of these birds. 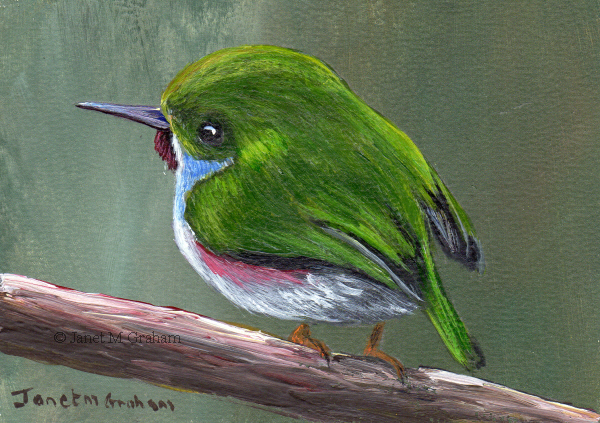 Cuban Tody measure 3.5 x 2.5 inches and is painted on Colourfix Smooth paper. I love the markings of this one. Really pleased with how it turned out. Black Throated Blue Warblers breed in North Eastern United States and South Eastern Canada. They winter in the Caribbean. They measure 11 - 13 cm in length and weigh between 8 - 12 grams. 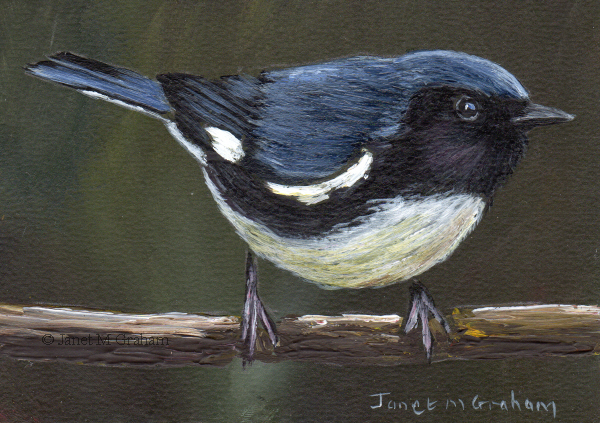 Black Throated Blue Warbler measures 3.5 x 2.5 inches and is painted on Colourfix Smooth Paper. Many thanks to Ron Knight for the reference photo. I love how this one is clinging to the tree. I did quite a few glazes to build up the depth to the feathers. 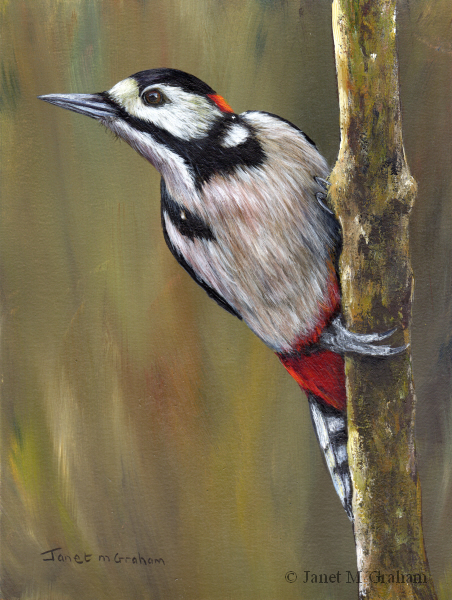 Great Spotted Woodpecker measures 6 x 8 inches and is painted on Colourfix Smooth paper. This one was rather fun to paint as everything just seemed to work. 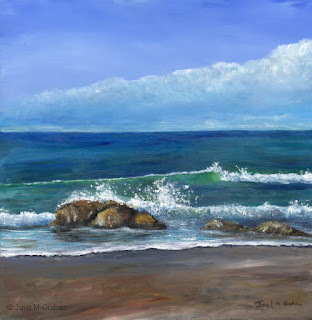 Kirra Beach 3 measures 12 x 12 inches and is painted on Ampersand Smooth Panel. I love this ones markings. Red Naped Sapsuckers are found in North America. They measure around 19 - 21 cm in length and weigh between 32 - 66 grams. 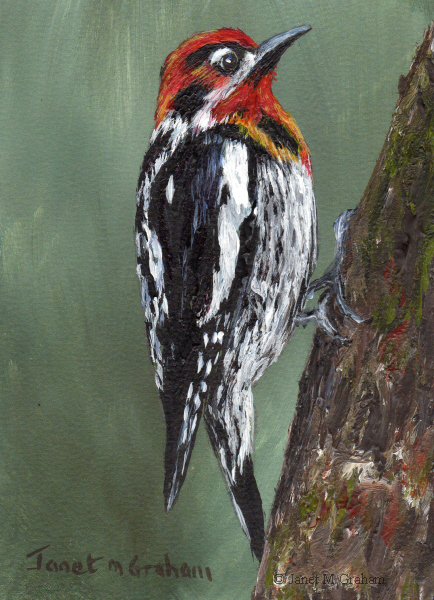 Red Naped Sapsucker measures 2.5 x 3.5 inches and is painted on Colourfix Smooth paper. White Crested Elaenia's are found in South America, They measure around 13.5 - 15 cm in length and weigh between 12.5 - 24.3 grams. 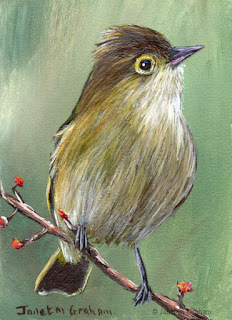 White Crested Elaenia measure 2.5 x 3.5 inches and is painted on Colourfix Smooth Paper. On one of my holidays to Tasmania a few years back, I specifically went looking for the Pink Robin. On the forest walk, I never come across him but when I got back the car, there he was admiring himself in the car's side mirrors. 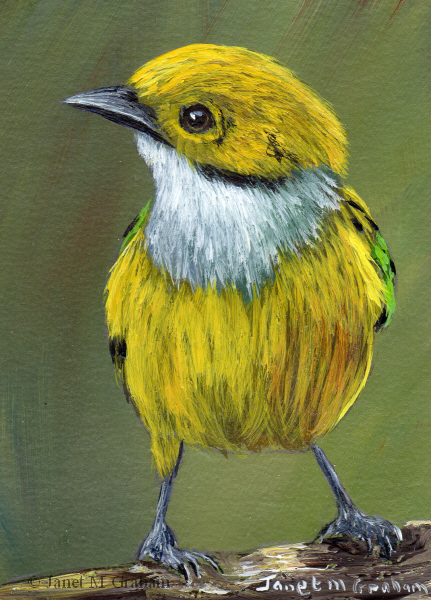 I took lots of photos but only ended up painting one aceo from the batch I took mainly because the photos are not the best reference photos to use - he is sitting on a blue car mirror and the background is not that great either. 900 plus paintings later, I have started to revisit my earlier photos as I see things a little bit differently now. For this one, I love the tilt of his head but that was about all I liked in the reference photo. So I ended up adding a branch, changing the background colour and highlights. Really love how the painting turned out. 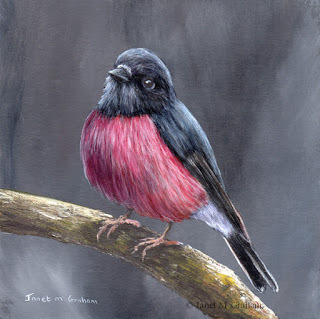 Pink Robin measures 6 x 6 inches and is painted on Colourfix Smooth Paper. I love the feather colours of this one. Really pleased with how it turned out - everything just seemed to work. Silver Throated Tanagers are found from Costa Rica through to Panama and western Colombia to western Ecuador, They measure around 13 cm in length and weigh around 21 grams. 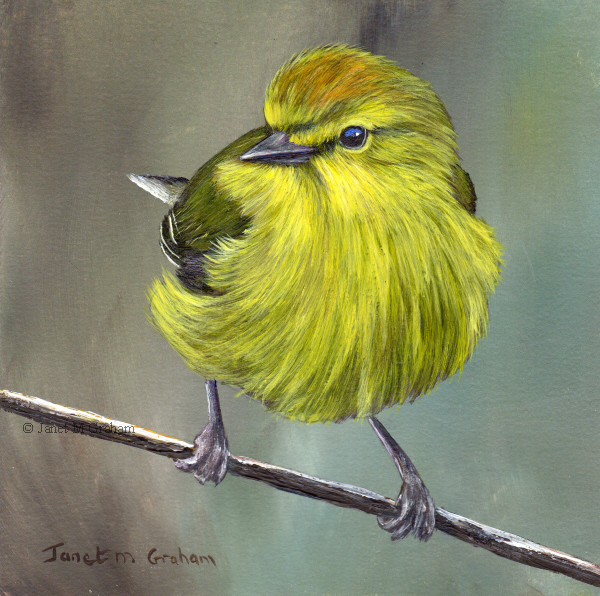 Silver Throated Tanager measures 2.5 x 3.5 inches and is painted on Colourfix Smooth Paper. I love the tilt of this ones head. Golden Crowned Sparrows are a large American Sparrow found in the Western part of North America. They measure 15 - 18 cm in length and weigh between 19 - 35 grams. 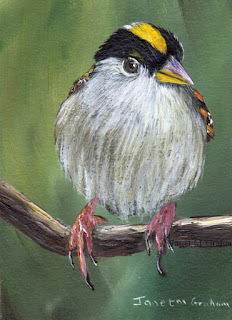 Golden Crowned Sparrow measures 2.5 x 3.5 inches and is painted on Colourfix Smooth Paper. Chestnut Crowned Warbler measures 5 x 5 inches and is painted on Colourfix Smooth Paper. I love this ones feather colours and the angle of it's head. Orange Crowned Warbler measures 5 x 5 inches and is painted in Colourfix Smooth paper. I have had this one printed out for quite awhile to paint - I keep adding to my pile so some of them get forgotten about until I sort through the pile and rediscover them. The Goldcrest is the smallest European bird measuring around 8.5 - 9.5 cm in length and weighing about 4.5 - 7 grams. They are found over much of Eurasia. 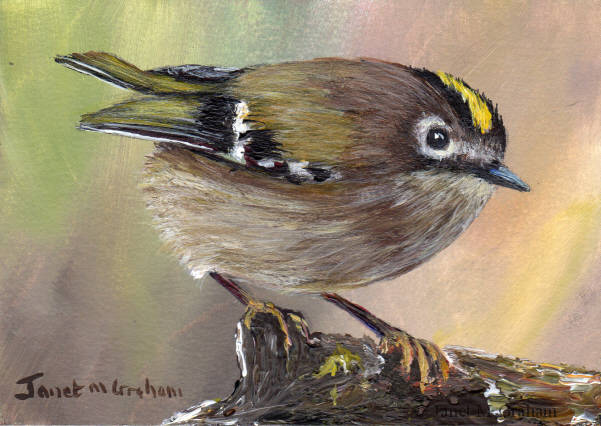 Goldcrest measures 3.5 x 2.5 inches and is painted on Colourfix Smooth Paper. 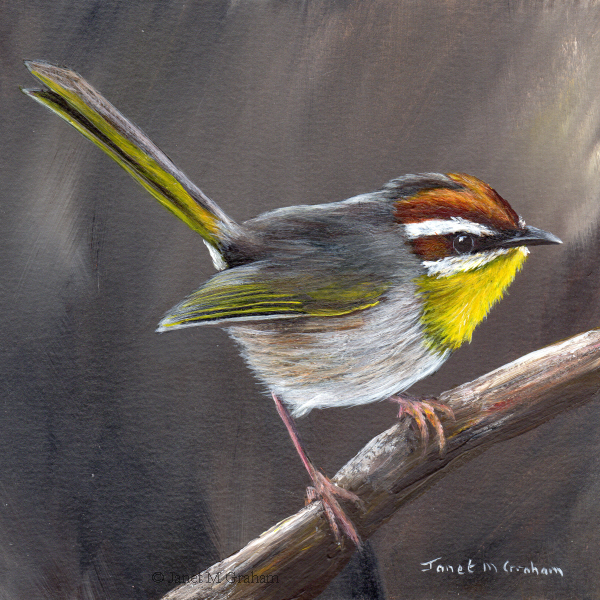 Hume's Leaf Warblers or Hume's Warblers breed in the mountains of inner Asia and winter mainly in India. They measure around 10 - 11 cm in length and weigh between 5 - 8.8 grams. 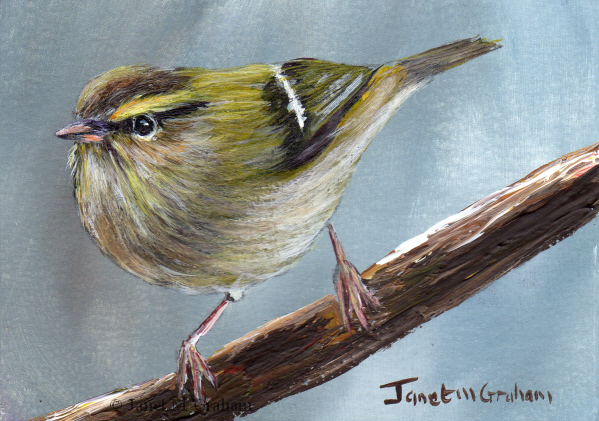 Hume's Leaf Warbler measures 3.5 x 2.5 inches and is painted on Colourfix Smooth Paper. 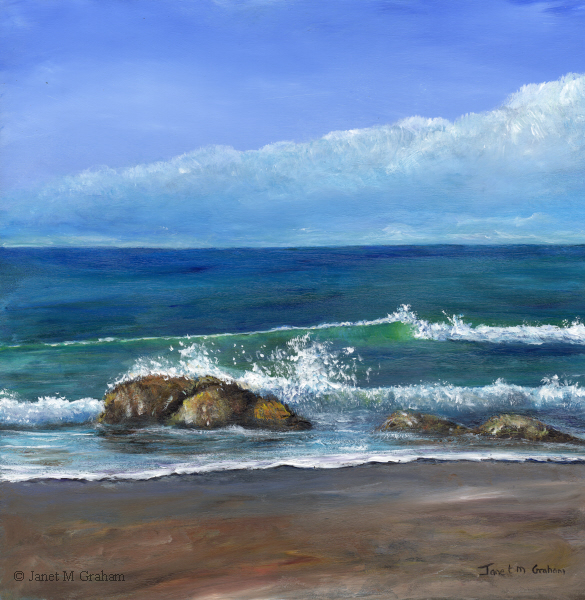 I enjoyed painting this one as everything just seemed to work. 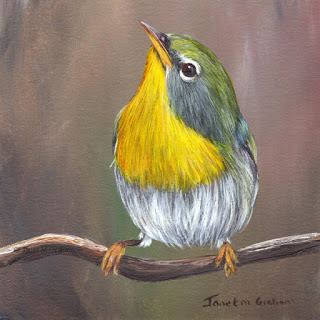 Northern Parula measures 5 x 5 inches and is painted on Colourfix Smooth Paper. 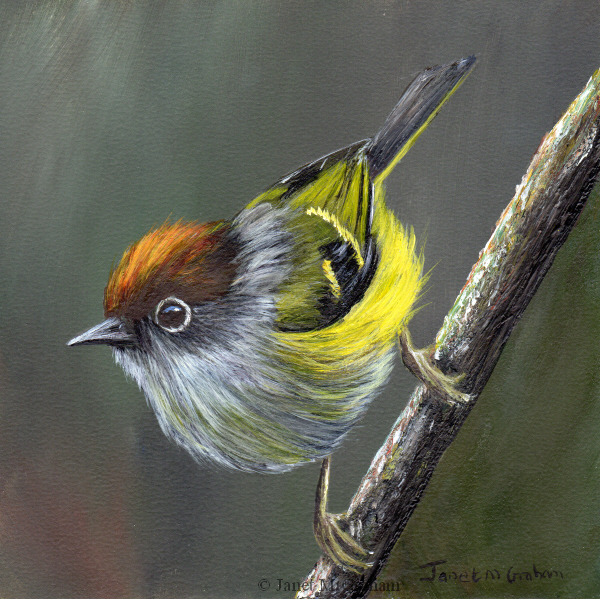 I love painting chickadees. A lot of layers/glazes went into this one to build the depth to the feathers. 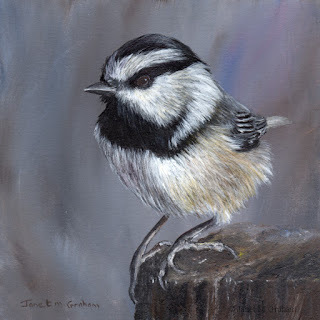 Mountain Chickadee No 3 measures 6 x 6 inches and is painted on Colourfix Smooth Paper. 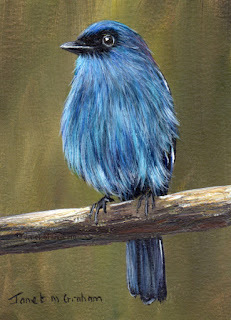 I love the blue feathers of this one. I did quite a few layers with glazing in between to get the depth to the feathers. Mountain Verditer Flycatchers are found in Southeast Asia through to Sumatra. 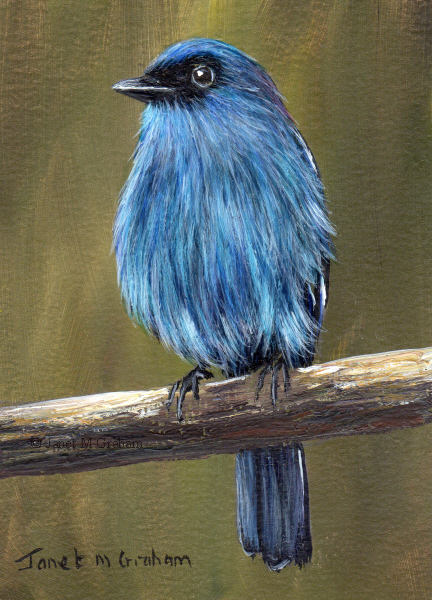 Mountain Verditer Flycatcher measures 2.5 x 3.5 inches and is painted on Colourfix Smooth Paper. 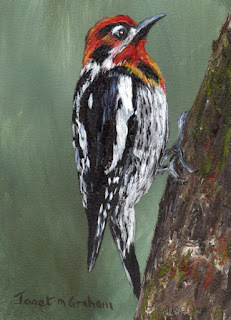 I love how this one is perched on the branch singing away. Sedge Warblers breed in Europe and Asia and winter in Africa. They measure around 11.5 - 13 cm in length and weigh about 12 grams. 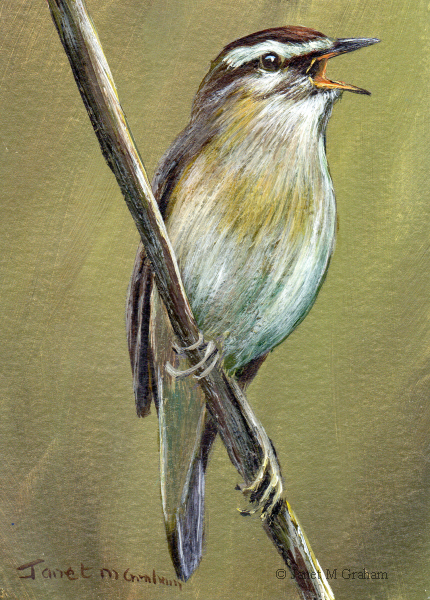 Sedge Warbler measures 2.5 x 3.5 inches and is painted on Colourfix Smooth paper. I love how this one is perched on the branch. I did quite a few layers to the head feathers to get the required depth. 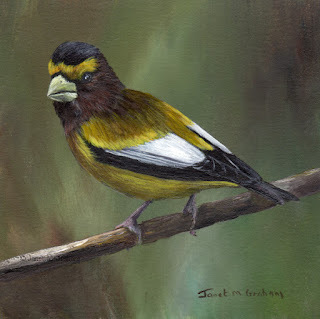 Evening Grosbeak measures 5 x 5 inches and is painted on Colourfix Smooth paper. I love these ones markings. Really pleased with how he turned out. Rufous Capped Warbler No 5 measures 5 x 5 inches and is painted on Colourfix Smooth paper.